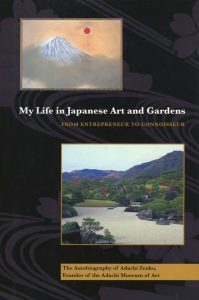 Zenko Adachi (1899–1990) tells the story of how a scrappy and impoverished boy from rural Japan turned the profits from his flair for dealmaking into a world-class museum and garden. A poor student, bullied in school, the gregarious Adachi learned to seize on every opportunity that came his way. He began as a lowly coal hauler and, after a short stint in the military built a series of businesses in Osaka. Always the opportunist, during WWII he sold the army swords while buying up timberland for the expected postwar boom. He was a rice broker, a textile wholesaler, and a real estate man. He went to jail (unjustly). He had close friends who both loved and betrayed him.